Transport yourself into a garden of relaxation and reflection. Inspired from Chinese architecture, the vast circular opening of the Moon Gate arch creates an inviting garden passageway. 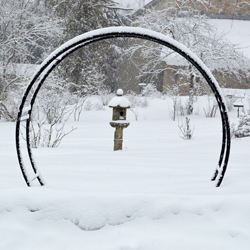 Our arches are made with graceful curves of tubular steel, powder coated black. 108" tall in center, 120" wide, 20" front to back, 75" outside across base, 67" inside. Includes 4 x 18" ground spikes to anchor base plates. Must ship by truck freight. Freight quote required. Weighs approximately 86 lbs. Brackets are heavy, hand-welded steel, painted black. Brackets clamp tightly with nuts and bolts, onto lampposts from 3" - 7" in diameter. 27-1/2" high overall x 43" across overall. 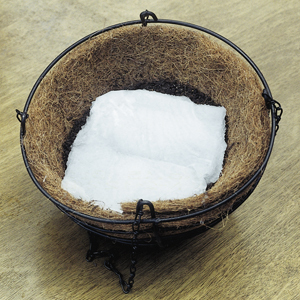 Coco-fiber is a natural by-product from coconut farming in Sri Lanka. 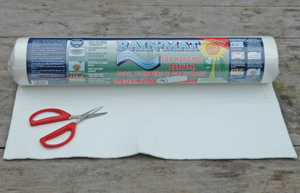 The liners are preformed with natural latex, so they are ready to fit right into your planter. 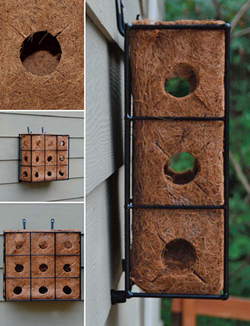 If you are ordering for lamppost hayracks, you will need 1 case of 2 per hayrack. 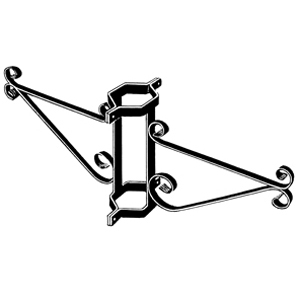 Traditional design features heavy gauge steel wire, hand-welded and coated in black plastic. Extra deep for outstanding plant growth. 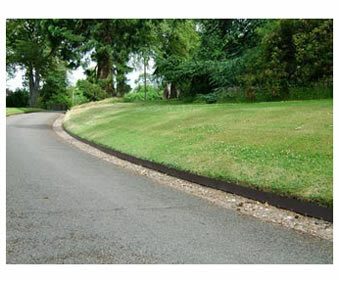 Use moss liners for side planting. Sturdy black chains and ring. 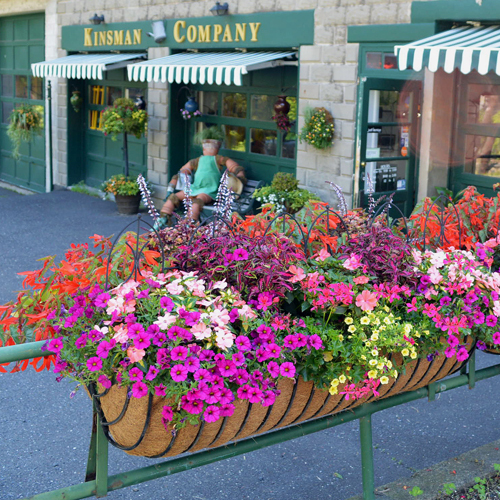 Use under windows, on walls or railings Our European Classic Hayrack planters are a beautiful alternative to traditional window boxes. There is a range of sizes to complement most architectural styles. Each piece is hand-welded steel, thickly dipped in black plastic for permanent corrosion protection. Their quality is unrivaled. 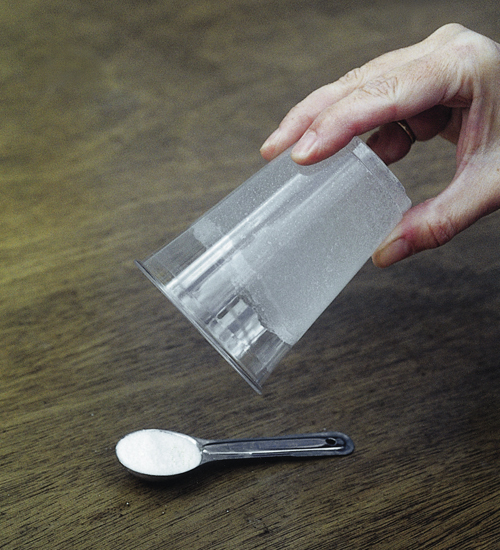 For any expanse of wall, railing or window over 6 ft. long, this is the solution. Two halves combined with any number of center sections will match the scale of big windows and buildings. 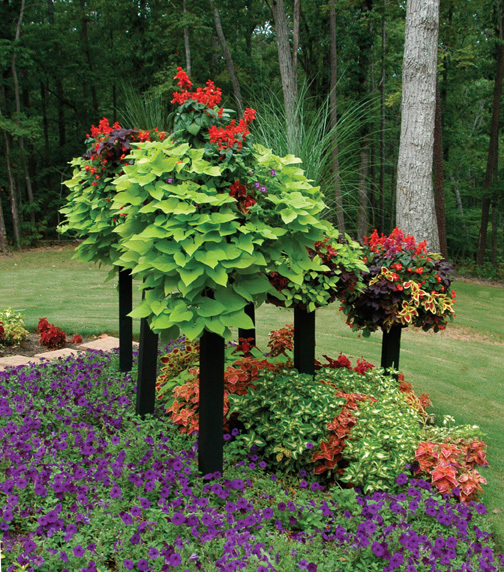 The results outshine any window box or container because these are the deepest, most substantial wall planters available. 80" Sectional Hayrack, in two 40" halves 80" long x 14" wide x 14" deep. 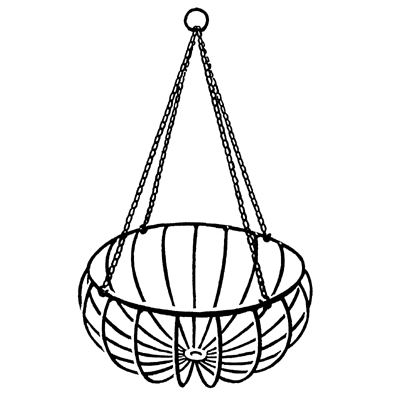 Carousel Basket is 18" diameter x 10" deep. Overall height is 33". 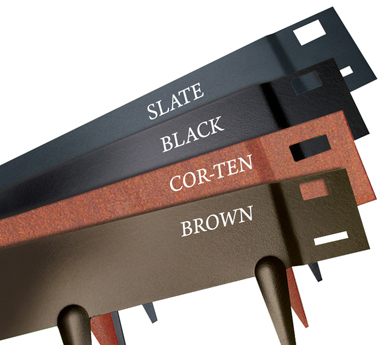 Hand-welded steel, coated in black plastic for corrosion protection. 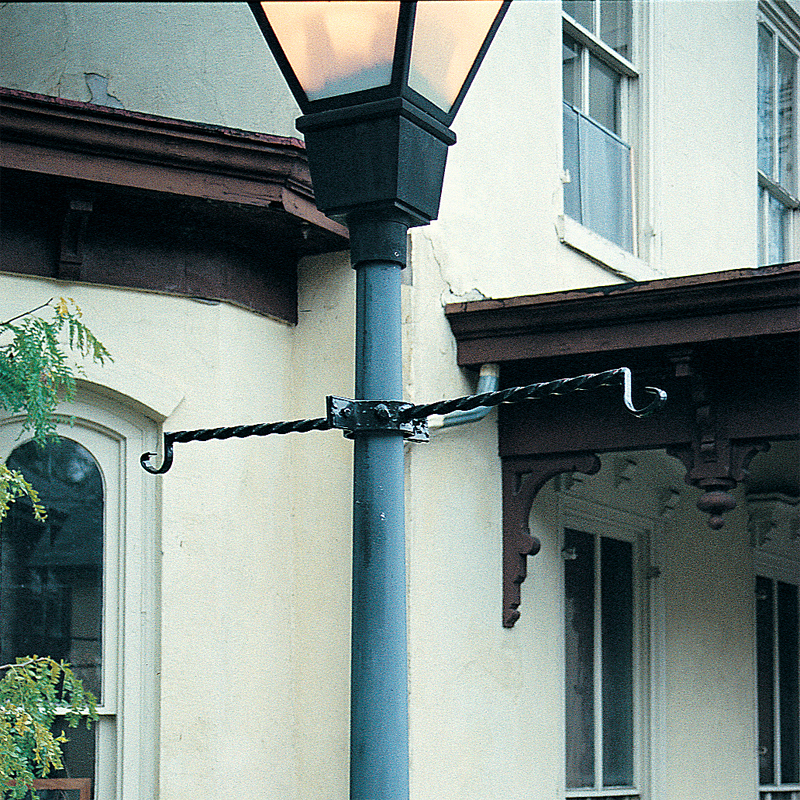 Gas Lamp Style Bracket Adjusts to fit lampposts from 3" to 4" in diameter using set screws. 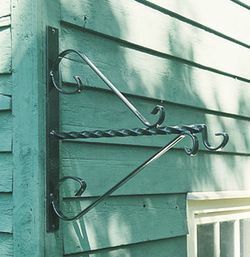 Traditional Victorian design with twisted steel arms, coated with black plastic. 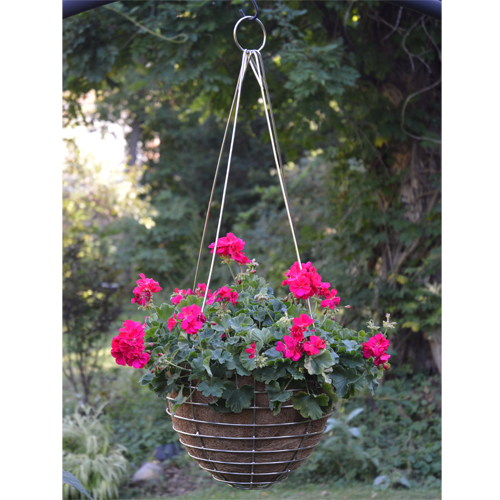 Holds 2 hanging baskets up to 17" in diameter. (use KC6 or KC7) 4" diameter collar, 42" overall. 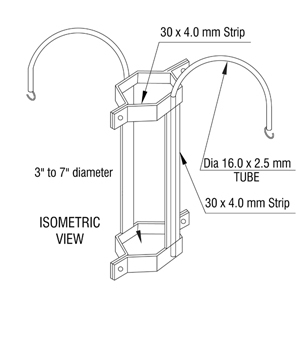 Lamppost Bracket for larger lampposts This heavy-duty bracket fits lampposts 5" to 7" diameter and has two levels of support for great security. 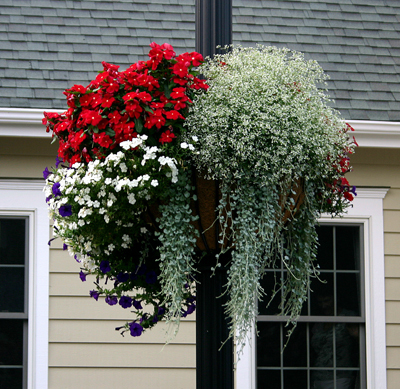 It is suited to carry a pair of large hanging baskets. (use KC7 or KC8, or use KC93) 40-1/2" across overall. Height is 15-3/4". 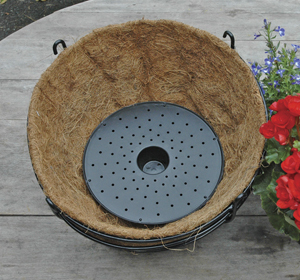 Flower Well is a sturdy plastic reservoir for hanging baskets and planters that captures water and food that would otherwise drain away. 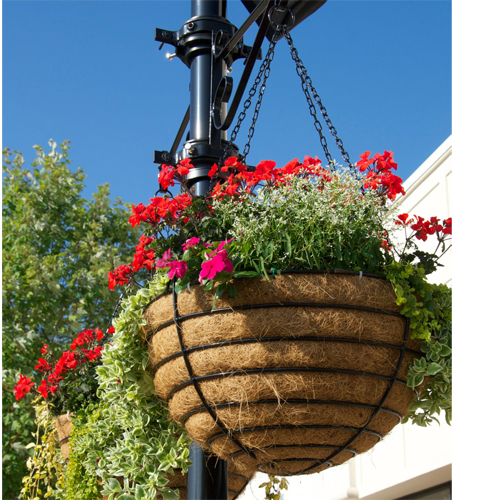 So your hanging baskets can go longer before watering and dripping is much reduced. 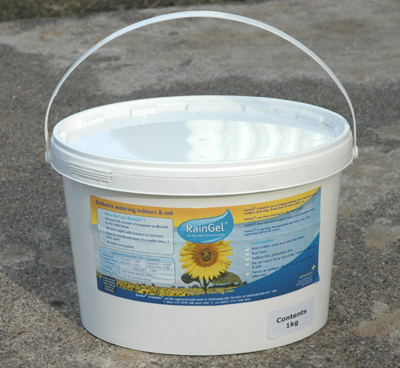 Holding a full quart, Flower Well concentrates the liquid in a central well from which plant roots and capillary action can draw up the nourishment. 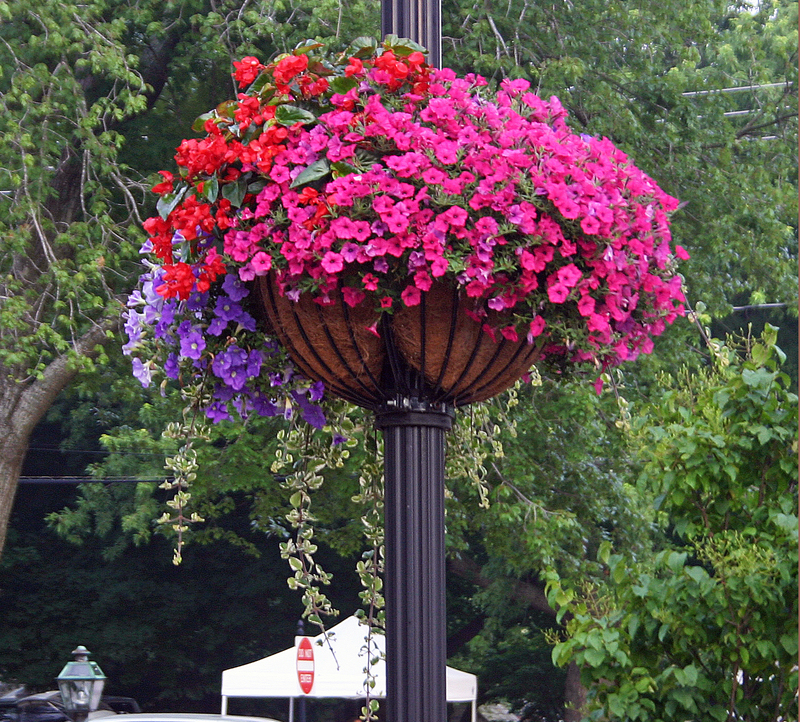 Made from recycled material, Flower Wells can be re-used over and over again. Top has over 100 drainage holes, central well is 2" across. 8-3/4" across overall x 1-3/4" deep. 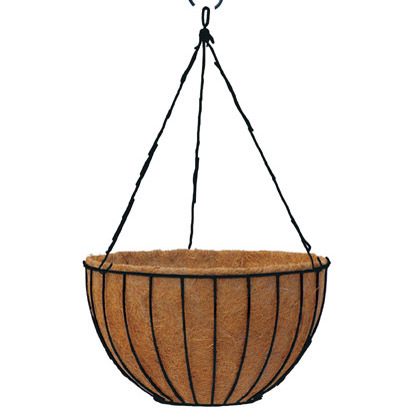 Fits baskets and planters 12" diameter and above. 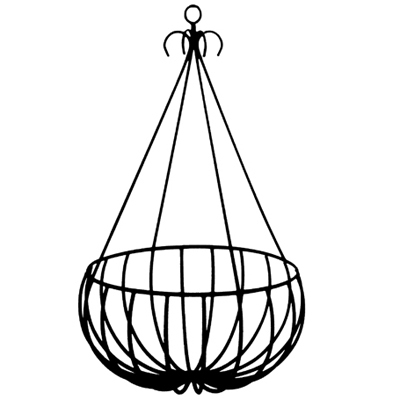 For hanging baskets. 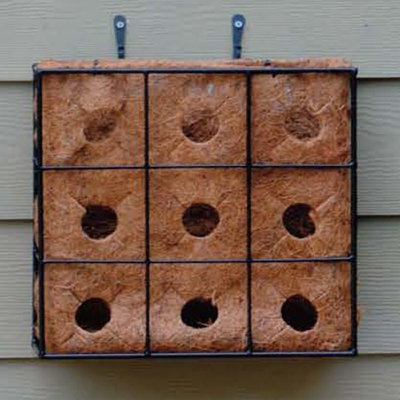 Each pack contains 4 mats, 7" square each Place these mats down in the growing medium at root level as you plant each basket, hayrack or planter. 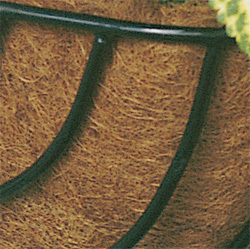 These mats soak up water as rapidly as Rain-Gel but provide a stable reservoir which the roots will actually grow into. They can reduce the need for watering to as little as once every 7-10 days. 22" wide x 16-1/4 ft. long. 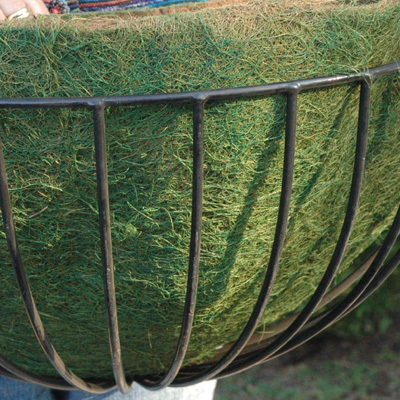 Cut to size for hayracks, planters and larger baskets Place these mats down in the growing medium at root level as you plant each basket, hayrack or planter. These mats soak up water as rapidly as Rain-Gel but provide a stable reservoir which the roots will actually grow into. They can reduce the need for watering to as little as once every 7-10 days. 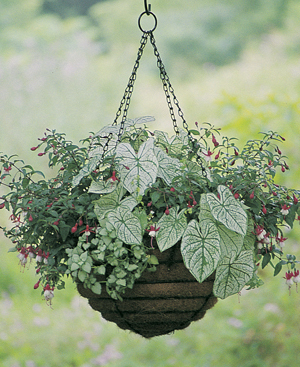 When filled with water, Water Slice can be lifted out and placed in a hanging basket without dripping. 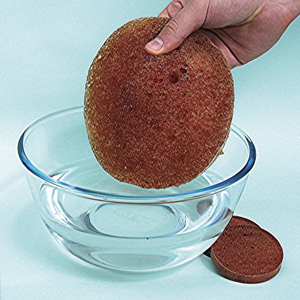 Material holds air, as well as water, promoting healthy root development.